Croak! Squeenk! Ribbet! After a close encounter with a mutant amphibian makes him freaky for frogs, water-shy Stink becomes a swimming success. Stink may be super smart, and Stink may be uber clever, but he's been in the Polliwog swim class frog-ever and he still can't bear to put his face in the water. Why would he want a geyser up his nose, on purpose? But then something weird happens: Stink starts to see frogs everywhere -- in the locker room, in his boot, in the bathtub. And when a freaky blue frog licks his arm, his froggy senses start tingling! He has an urge to slurp up raisins (that look like flies). He can't wait to play in the rain and mud. He's a wiz at identifying frog calls. And he has become very interested in the local frog population. Could it be that Stink is turning into . 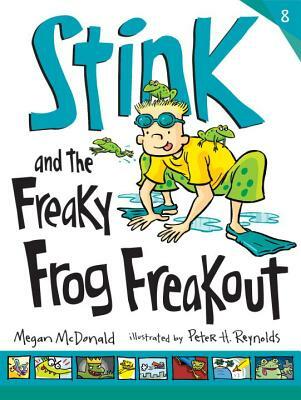 . . the amazing Stink-Frog, fighter of slime? Pree-eep! Craw-awk!